While the association of a number of risk factors, such as family history and reproductive patterns, with breast cancer has been well established for many years, work in the past 10–15 years also has added substantially to our understanding of disease etiology. Contributions of particular note include the delineation of the role of endogenous and exogenous estrogens to breast cancer risk, and the discovery and quantification of risk associated with several gene mutations (e.g. BRCA1). Although it is difficult to integrate all epidemiologic data into a single biologic model, it is clear that several important components or pathways exist. Early life events probably determine both the number of susceptible breast cells at risk and whether mutations occur in these cells. 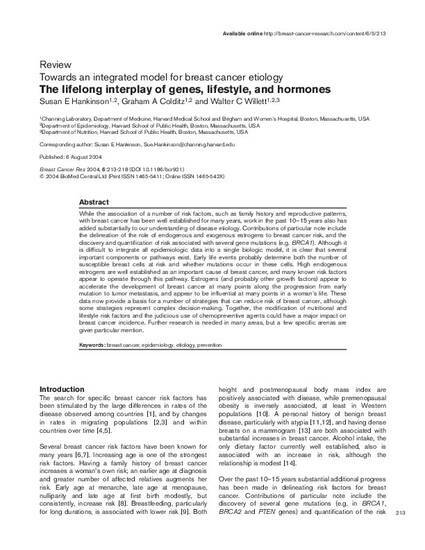 High endogenous estrogens are well established as an important cause of breast cancer, and many known risk factors appear to operate through this pathway. Estrogens (and probably other growth factors) appear to accelerate the development of breast cancer at many points along the progression from early mutation to tumor metastasis, and appear to be influential at many points in a woman's life. These data now provide a basis for a number of strategies that can reduce risk of breast cancer, although some strategies represent complex decision-making. Together, the modification of nutritional and lifestyle risk factors and the judicious use of chemopreventive agents could have a major impact on breast cancer incidence. Further research is needed in many areas, but a few specific arenas are given particular mention.